This year the club couldn't raise enough interest to make it viable for a club function. I decided to go it alone and headed up the hill QG62EK not far from my place. 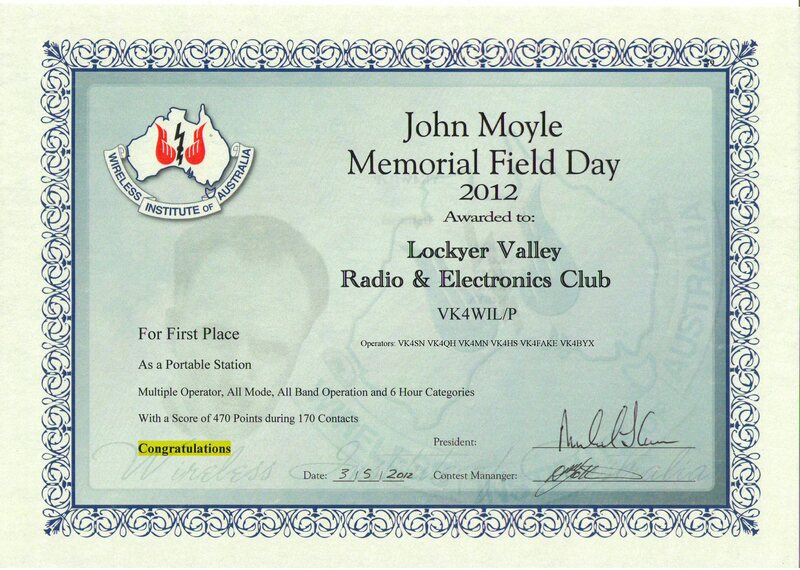 I arrived on site about 9am after putting our repeater back on line. 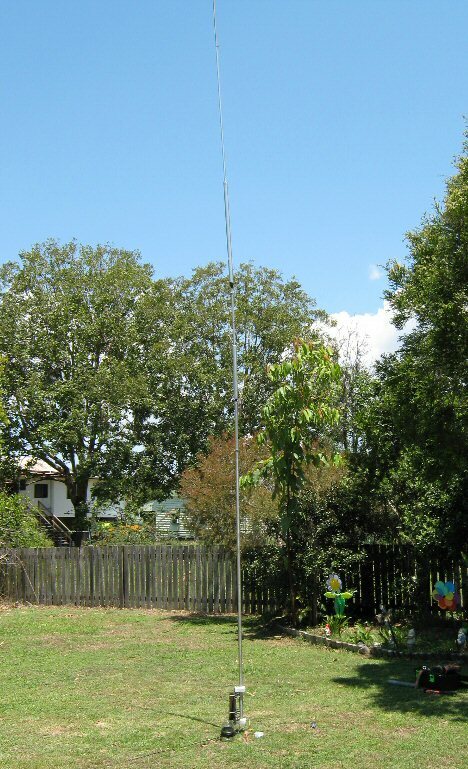 I setup the tribander on the pump up mast, a vertical, and a 1/2 wave 80 meter dipole hung from under my beam on the mast. I'm working HF only. 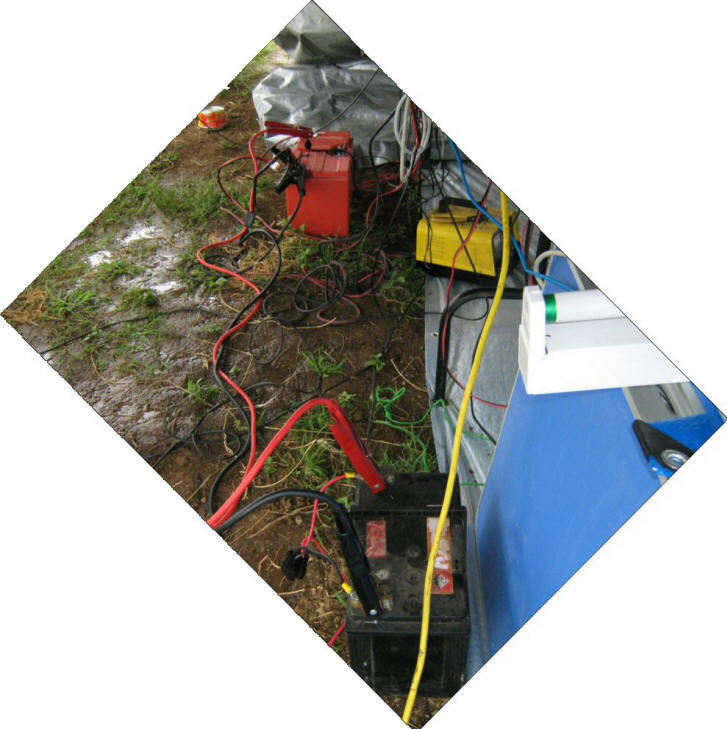 I used a 1KW generator to power the site, with a battery charger and 2 x 6V 120Ah batteries for backup. Contacts, I thought, were low compated to last year and it was slow going. Switching from 40, 20, and 80 back and forth to try and make up numbers. Sitting and calling wasn't always the best, and found that search and pounce gathered more contacts where it's normally the other way round. It was good to catch up with calls that I had only talked to via facebook. Thanks for the contacts everyone. I finished up around midnight, and when morning came around the forecast was for 40 degrees with the possibility of thunder storms, so I packed up to beat the heat and headed home. 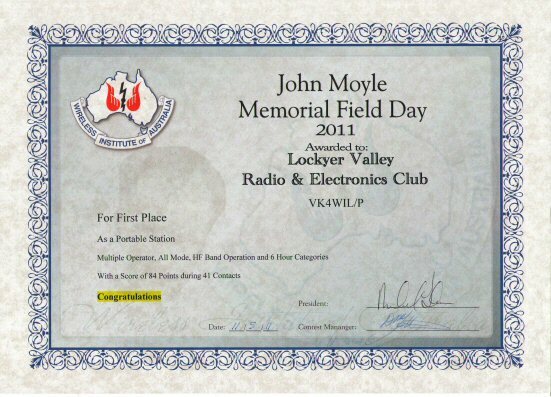 Although the contest was slow it was a good excercise to check my field day equipment was still in good order and have fun making a few contacts. Found a nice spot under the shade of the trees to set up. 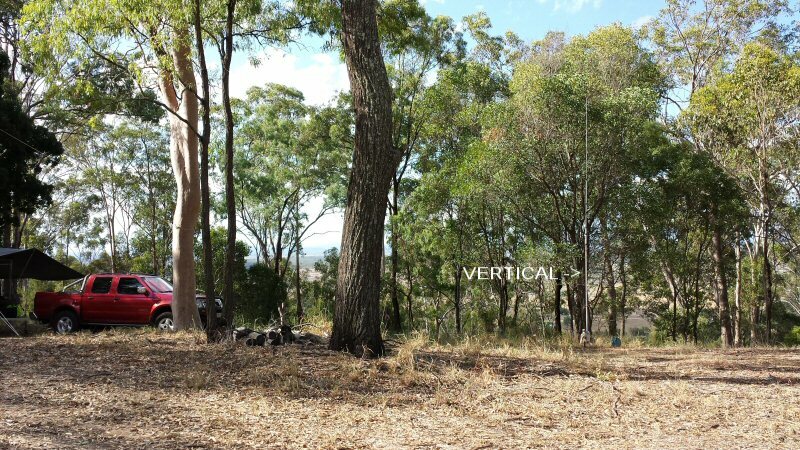 Vertical mounted on ground (right). I was lazy and started with 4 radials and reports were not favourable and some could not hear me. I gathered up my 10 other radials and connected them up and what a difference they made. Moral of the story - use as many radials as one can muster. 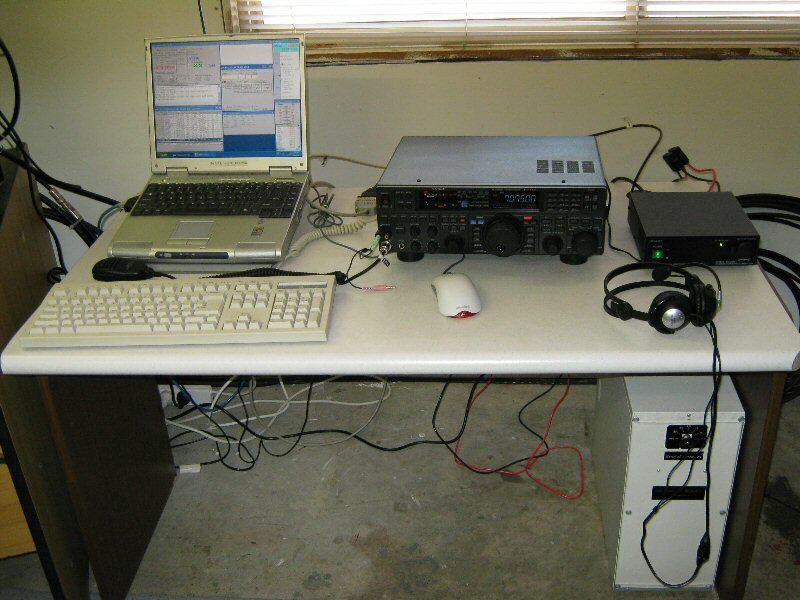 I used the 5 band vertical for 7MHz only. 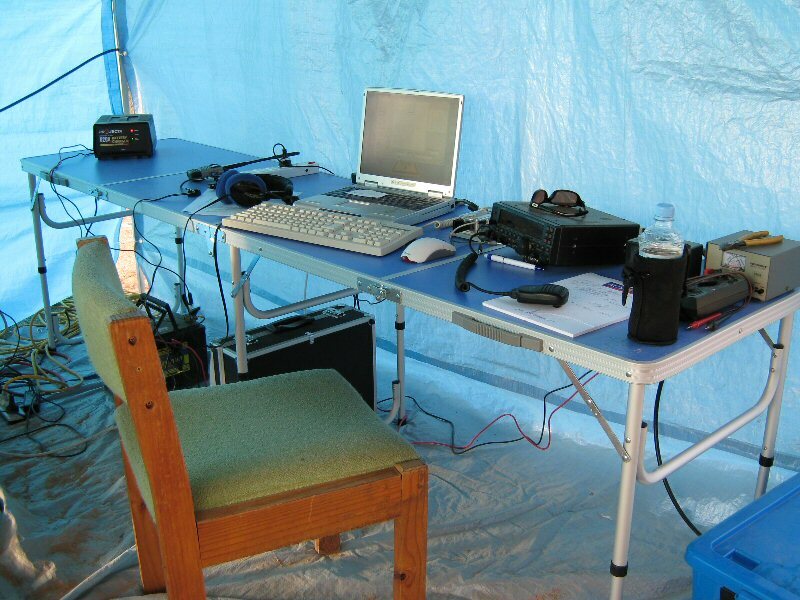 VK4SN (Me) working stations. I had a visitor show up who took the photo. 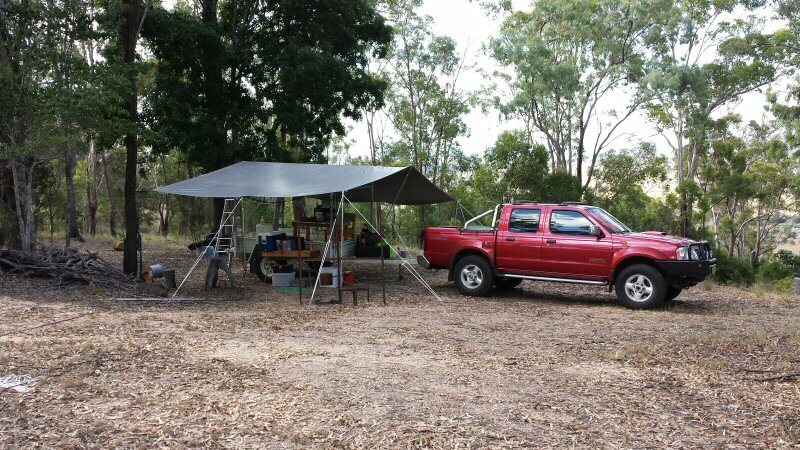 After many weeks of getting everything together for the field day, and arranging the best site possible, Friday arrived and Alan VK4SN and myself VK4QH heads up to the ridge above Laidley. 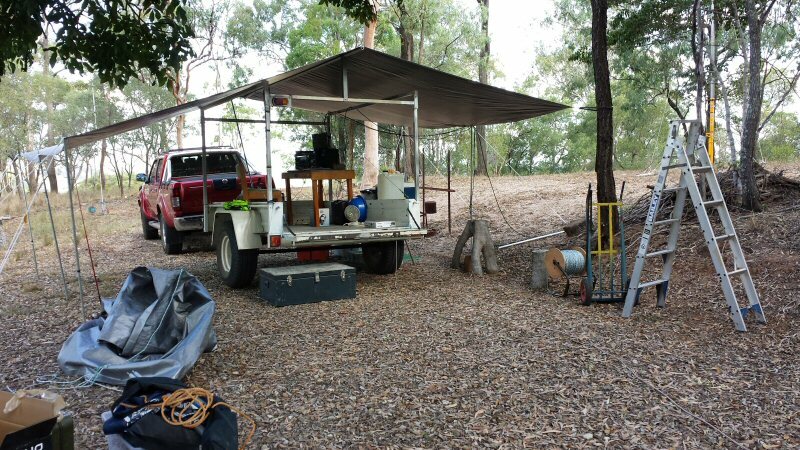 We stopping in at Johns, VK4FJFM's to pick up some batteries to power the radios then headed up the range to the spot which is a cattle holding yard. 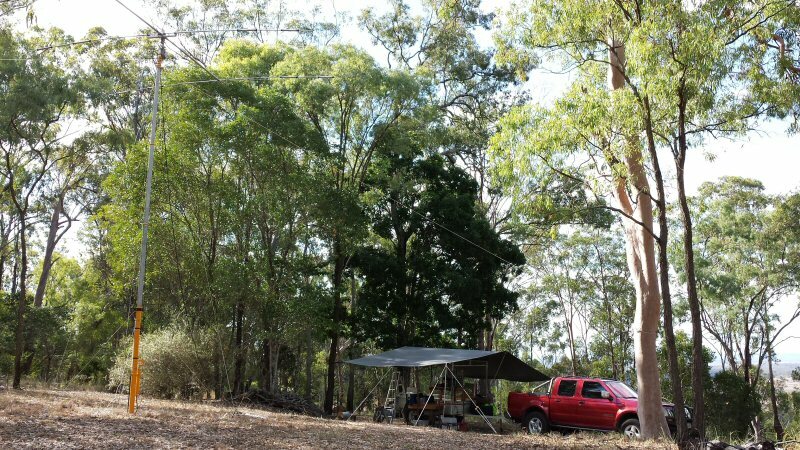 Everything went well setting up the 3 element tri-bander on the pump up mast and the OCF dipole connected to the poles in the yard and finally Alan’s trapped vertical connected to the trailer. 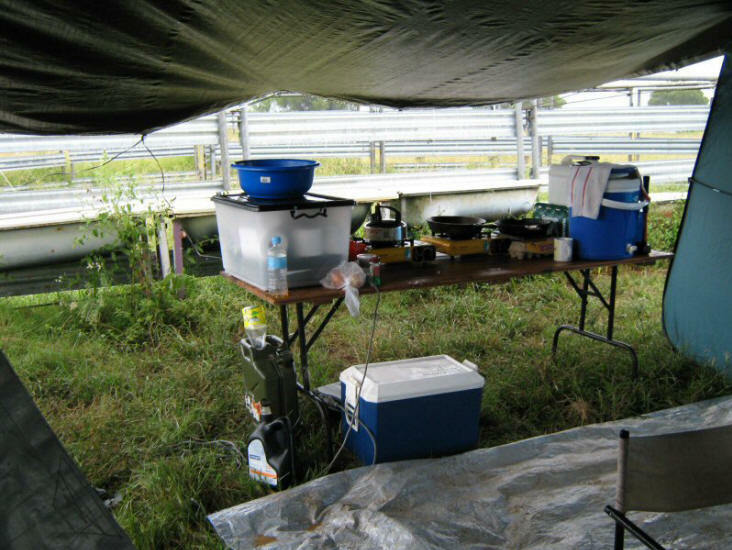 We set up the operating desks, generator and the cooking table, everything going to plan. 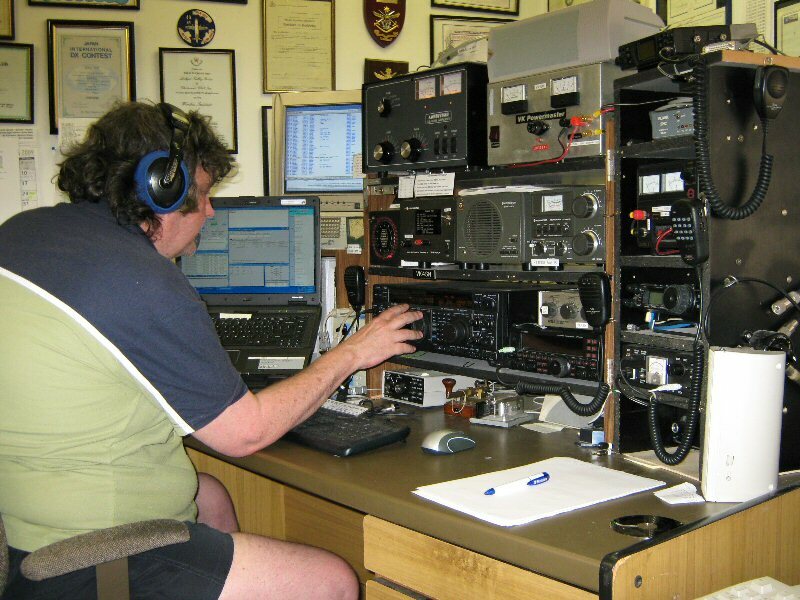 Friday night saw us testing gear and joining in on the VK4WIL net on 3570KHz moderated my Graham VK4KML. Alan’s Battery charger decided to pack it in so it was a mercy dash to the father-in-laws place to get a battery charger that would keep up to the current draw. VK4KHP Peter and VK4FKEZ Heather came up and spent a few hours socializing at the site. 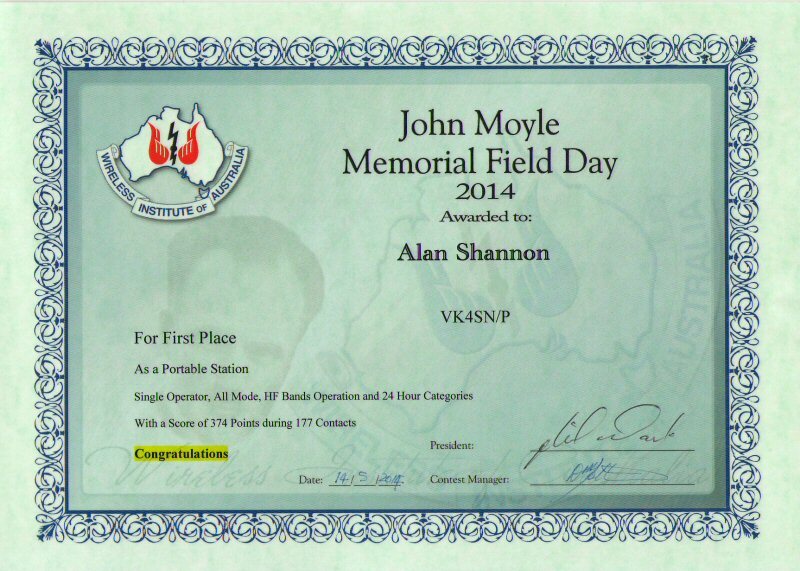 Then, Saturday morning John Moyle field day Starting at 0100Z, we woke up to a torrential downpour. 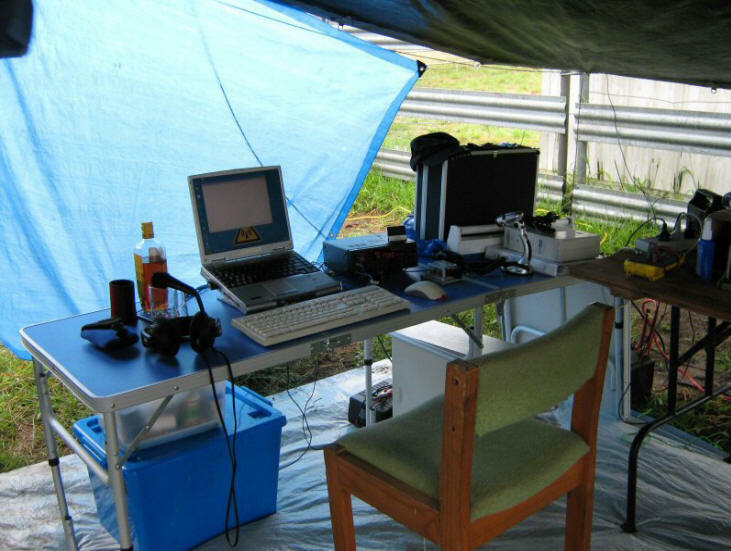 Alan had put up extra Tarps to protect the gear. 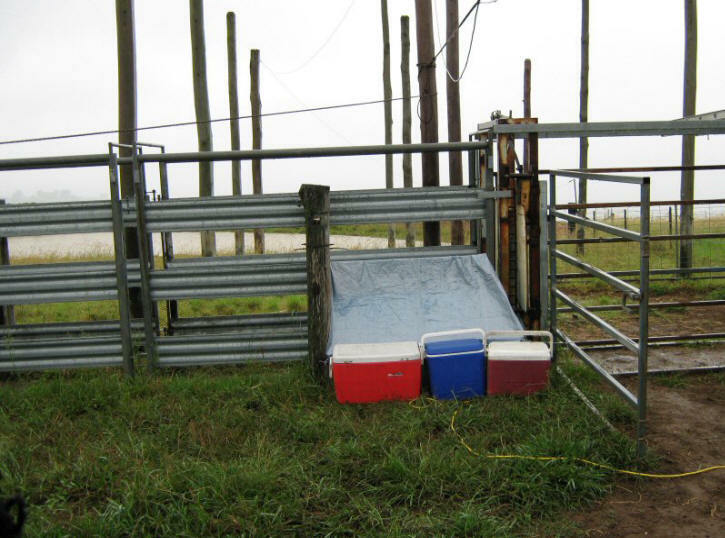 I exited from my cosy bed in the back of the jeep and strolled into the cattle yard, had breakfast and then waited for the event to start. The event started and Alan and I started calling and getting a few contacts then Alan’s radio started to have problems as he frantically tried to fix the problem. I kept calling getting some more contacts. Nearing the end of the first 3 hour block, Alan had tried all he could and the FT450 was out of commission. Meanwhile the rain had not given up and there was a steady flow of water flowing around us and under the ground tarp - things were looking grim. 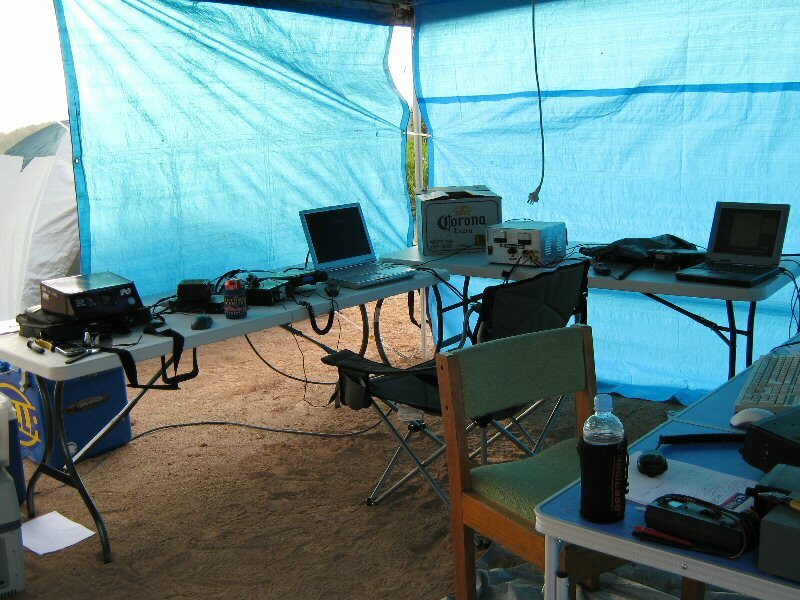 We hooked up the FT847 for Alan to use but then for some unknown reason we could not get VKCL to connect to the radio, by that time the rain was getting heavier. Peter VK4MN arrived to help out but never got too, as we decided to call it a day. Everything that could go wrong was happening. So we called Peter VK4KHP to see if he would come up and help us pack up everything. He arrived 5 minutes later. The 4 of us packed up all the gear and we headed home. Thanks to anybody else who was going to come up over the weekend, Sorry we had to end it so early. 4th Place, Section D: Multi-Op, 8 Hours. 808 Points. 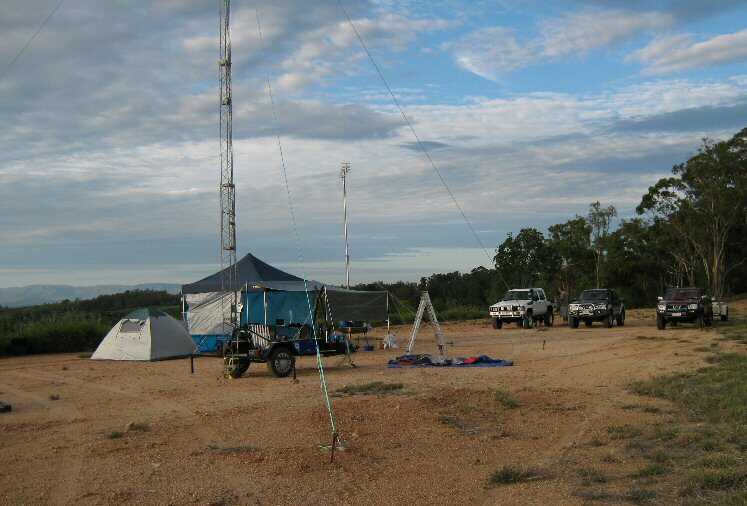 Thanks to Andrew, VK4HAM for his magnificent trailer tower and to Trent for the antennas on top. Lengths of aluminium were used for the ground plane and held together by hose clamps. The antenna was set up this way as a temporary measure as it's moving to a new home after the contest. 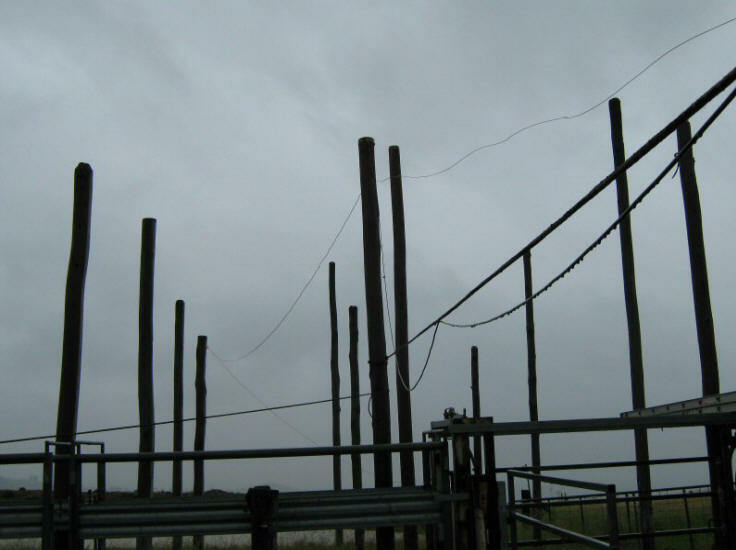 Photo taken showing the ground radials on the ground. Notice the tower is located on the other side of the house. Radials are so important as the ground here is the worst ever and has little to no conductivity. 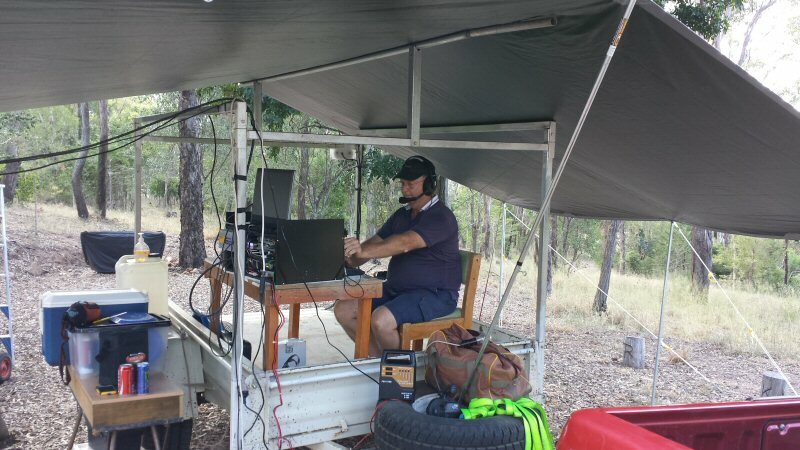 Graeme, VK4DZ, operating the station as VK4SN in the main ops position. 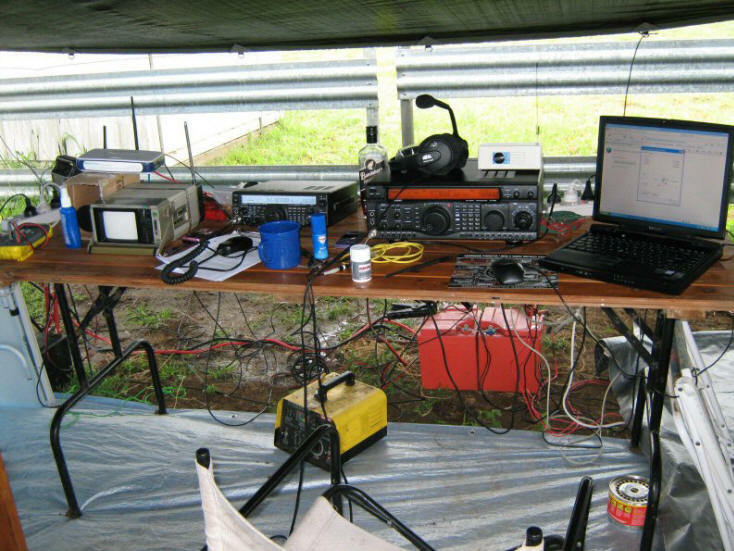 Station 2, the listening post connected to the 5 band vertical on test. 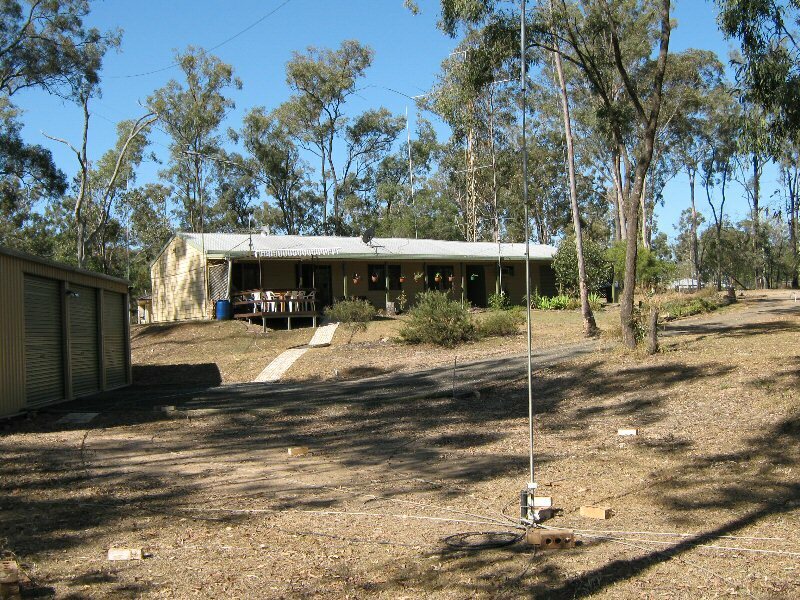 The 5 band vertical is now in VK4DZ's backyard on test. There are ten radials buried in good soil at this location.